In recent years, there has been a small decrease in the number of new cases of ovarian cancer and the number of deaths from ovarian cancer. New cases of ovarian cancer and deaths from ovarian cancer are higher among white women than black women, but have decreased in both groups. The use of estrogen -only hormone replacement therapy (HRT) after menopause is linked to a slightly increased risk of ovarian cancer in women who are taking HRT or have taken HRT within the past 3 years. 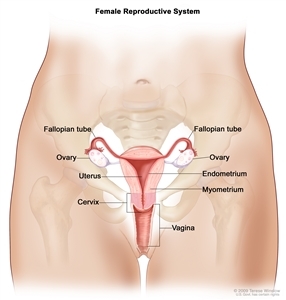 The risk of ovarian cancer increases the longer a woman uses estrogen-only HRT. When hormone therapy is stopped, the risk of ovarian cancer decreases over time. It is not clear whether there is an increased risk of ovarian cancer with the use of HRT that has both estrogen and progestin. Being overweight or obese during the teenage years is linked to an increased risk of ovarian cancer. Being obese is linked to an increased risk of death from ovarian cancer. Being tall (5'8" or taller) may also be linked to a slight increase in the risk of ovarian cancer. Breastfeeding is linked to a decreased risk of ovarian cancer. The longer a woman breastfeeds, the lower her risk of ovarian cancer. Risk of ovarian cancer in the peritoneum: Women who have had a risk-reducing salpingo-oophorectomy continue to have a small risk of ovarian cancer in the peritoneum (thin layer of tissue that lines the inside of the abdomen). This may occur if ovarian cancer cells had already spread to the peritoneum before the surgery or if some ovarian tissue remains after surgery. Studies of dietary factors including various foods, teas, and nutrients have not found a strong link to ovarian cancer. Some studies found a very small increased risk of one rare type of ovarian cancer in women who were current smokers compared with women who never smoked. Overall, studies in women using fertility drugs have not found clear evidence of an increased risk of ovarian cancer. Risk of ovarian borderline malignant tumors may be higher in women who take fertility drugs. The risk of invasive ovarian cancer may be higher in women who do not get pregnant after taking fertility drugs.